Today, Takeout staffers—as we do each weekday morning—met in a conference room and talked about which food-related news to share with readers. The final news slot was down to two stories. One was an extremely depressing story about how 10 Peruvians have so far died from food poisoning after accidentally ingesting insecticide. The other was about Rice Krispies Treats coming out with stickers featuring “Have a great day at school!” messages written in braille for visually impaired kids. We decided to spare you the unending slog of awful news by bringing you a happy piece of sunshine. 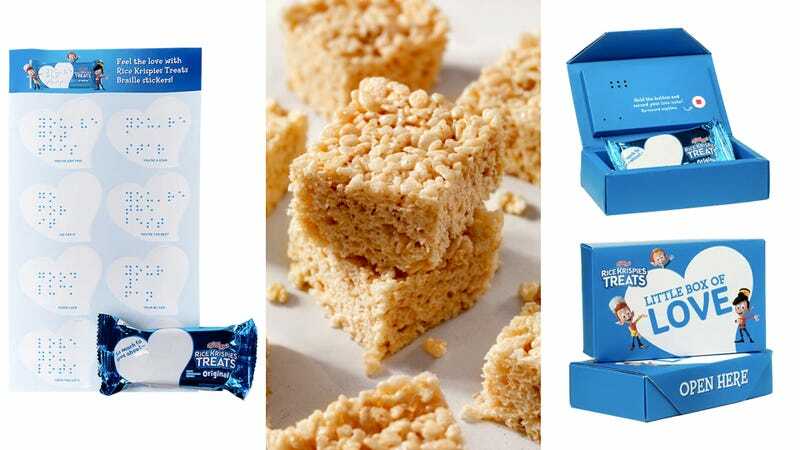 Here’s the back story: Last year, Rice Krispies Treats began offering heart-shaped stickers, which parents can write “love notes” and attach to their kids’ lunches. According to Kellogg’s site, they’ve partnered with the National Federation For The Blind to offer these same stickers with pre-written messages in braille. They’ve also come up with an audio box (to hold your Rice Krispies Treat, of course) with which parents can record a message. Kellogg’s is currently offering both stickers and audio box to families with low-vision children for free. This is nice. Be good to one another.